What drew me to Berlin was curiosity about the people and their lives in the East. Wolfgang Hilbig was once “one of German literature’s best kept secrets”, but that needn’t be the case any longer. Thanks to Isabel Fargo Cole’s translations, every bit as “enchantingly brilliant” as the original texts, Hilbig’s work is now available to English readers—including Asymptote Book Club subscribers. In our monthly Book Club interview, Isabel Fargo Cole talks to Asymptote’s Josefina Massot about the challenges of preserving Hilbig’s “music” in English, and discusses her own journey across borders and languages. Josefina Massot (JM): Wolfgang Hilbig’s prose has been described as lyrical, and your translation of The Tidings of the Trees certainly is. Part of what makes it so is its cadence—I often stopped to re-read passages out loud. How did you go about translating these? Did you allow yourself to play with sentence structure, for example, in order to preserve the “music” of the original? How do you feel about occasionally straying from the letter of a text in order to preserve its spirit? Isabel Fargo Cole (IFC): There’s an element of cold analysis—is he using short or long words, terse or convoluted syntax, alliteration, assonance, similarities or contrasts in sound and structure? But often it comes down to an intuitive sense of where the key emphasis in a sentence or passage lies, and how to produce an equivalent in English. I try to preserve Hilbig’s sentence structure as far as possible in English, because that’s what creates much of the music and rhythm. His sentences can be fragmented or elliptical, or unfold into a whole cascade of clauses; the shifting syntax produces shifting rhythms, but also crucially reflects the narrator’s mental state. So the “music” isn’t a distinct element that can be separated out. In general, I’m not sure there’s a hard and fast distinction between the letter and the spirit of a text. It’s a matter of making judgement calls in each particular instance and deciding where the emphasis lies or what motivates the use of a certain word. If I sense that he’s using a word mainly for its sound value and less for its literal meaning, I might feel free to change it. But sometimes the sound value resonates with the meaning, so ideally the English word has to convey the same synthesis. JM: Your first translation of a full-length work by Hilbig, The Sleep of the Righteous, came out in October of 2015; your fifth, The Females, is slated for this coming November. In 2017, you published your acclaimed debut novel Die grüne Grenze (The Green Border); I assume you wrote it while immersed in the translation of Hilbig’s work. How did the latter inspire your own, thematically and/or stylistically? IFC: I spent ten years writing Die grüne Grenze, and for about half that time I was also translating, notably East German writers such as Hilbig or his mentor Franz Fühmann. I don’t feel that either of them consciously influenced me in terms of style, but there could have been an unconscious influence—people have told me the book captures a certain East German “sound.” Certainly both these writers were crucial in giving me a very immediate sense of life in the GDR with its tensions and its dilemmas, and how these pressures affected people’s psyches. The main character in my novel is a writer living in East Germany’s “restricted zone” along the border in the Harz mountains, and trying to find a way to write about the taboo subject of the border. So my knowledge of Hilbig’s and Fühmann’s struggles to express themselves and deal with taboo subjects helped me understand my protagonist. Also, both Hilbig and Fühmann hark back to the tradition of German Romantic literature from the early nineteenth century, which was formally very innovative, often with fantastic/surreal elements, and concerned with the psyche and its darker sides, the tensions between the individual and society, and the relationship between people and nature. That’s an important source of inspiration as well. JM: Hilbig migrated from East to West Germany in the eighties. His relationship with each was complex: he struggled with state oppression in the GDR, for instance, but disliked consumerism in the West and experienced it as a “culture shock”—so you say in an interview with Madeleine LaRue for Music and Literature. Over two decades ago, you left the United States for Germany. Did you experience any kind of “culture shock” yourself, and if so, over what? How would you describe your relationship with the United States today? IFC: I moved to Berlin in 1995 and studied at the Humboldt University in what used to be East Berlin, and for years my circle of friends was entirely East German—what drew me to Berlin was curiosity about the people and their lives in the East. There was a lot of tension and culture shock, especially at first. Lots of very lively kitchen-table arguments. I’d always thought of myself as rather cynical about capitalism and western democracy as practiced, but I’d find myself defending them when faced with people’s nostalgia for East German socialism and their cynicism towards the rocky transition after reunification. Those kitchen-table discussions helped me question my own assumptions, abandon weaker positions, figure out what principles are really important to me and defend them better. Meanwhile, even as I’ve immersed myself in the dark sides of the socialist project, I’ve gained much more sympathy for the ideals that inspired it. And I’ve come to see European social democracy, however imperfect, as vastly superior to America’s plutocracy and dog-eat-dog mentality. It should be normal to live in a society that uses its resources to meet the needs of average people and especially take care of its most vulnerable members. So for years I’ve had a sense of culture shock when I go back to the US. Let’s not even get into how it feels now! JM: Despite being American, you write in German. In the aforementioned interview, you said that your first steps translating German literature had given you “an awareness of possibilities German has that English doesn’t” and that writing in German “allowed you to get out of some bad habits [you’d] had in English.” Could you mention some of these possibilities and habits, respectively? IFC: A few examples: Word order is more flexible in German, so that gives you a way to create different emphases. German seems to use more verbal “moods”, for instance for indirect speech, which adds subtle shades of meaning and perspective. And it makes more use of the impersonal “one”, which can add interesting ambiguities. So a sentence can be quite simple and straightforward, yet have a lot of nuances. I realized this while translating the writer Hermann Ungar, whose language is very spare—it was really hard to keep his sentences from sounding monotonous and wooden in English, because he was using these subtle devices we don’t have. That was back in 2005 and it was one thing that made me start experimenting in German. In my English writing I tended to be very flowery and lean on all our marvelous words—one strength of English is its incredibly rich vocabulary. Writing in German, especially restricted by my non-native abilities, helped me get back to simpler, clearer statements and made me more aware of what I was doing with the syntax, rather than hiding behind some surface notion of linguistic beauty or letting fancy words do the work. In the meantime my writing in German has also gotten more complex and involved, and I still love using the thesaurus, but I think I’ve found a better balance and my writing has more solidity due to the restrictions I’m working under. So for any writers out there who speak foreign languages—it’s worth experimenting in them! Everyone who does will end up in a different place, but you’re sure to discover lots of exciting things. 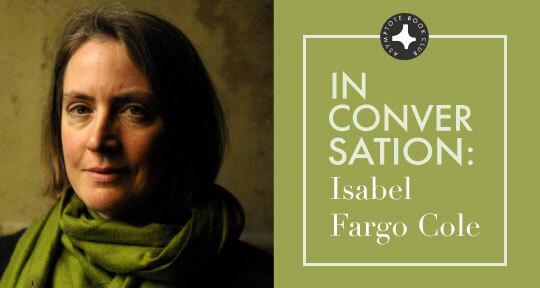 Isabel Fargo Cole is a U.S.-born, Berlin-based writer and translator. She has published the novella Ungesichertes Gelände (Unsecured Terrain, 2013) and the novel Die Grüne Grenze (The Green Border, 2017), recipient of the Leipzig Book Fair Prize. Her translations include four works by Wolfgang Hilbig, with a fifth forthcoming in November; notable among them is Old Rendering Plant, which earned her this year’s Helen & Kurt Wolff Translator’s Prize. She has also translated, among others, Boys & Murderers by Hermann Ungar, All Roads Are Open by Annemarie Schwarzenbach, and The Jew Car by Franz Fühmann, for which she received the prestigious PEN/Heim Translation Fund in 2013. From 2006-2016 she was the initiator and coeditor of no-mans-land.org, an online magazine for new German literature in English.